The page illustrates one of the many the challenges of managing a Web site that supports so many languages. Even something supposedly as simple as this temporary page is not quite so simple. There are a whopping 17 languages on this page — from Chinese to German to Japanese. Google generally does a very good job of “guessing” the Web user’s language through a combination of geolocation and browser language detection — and then providing users with their matching language. But in this case Google simply slapped up a “one-size-fits-most” Web page — which is a lot of visual noise. 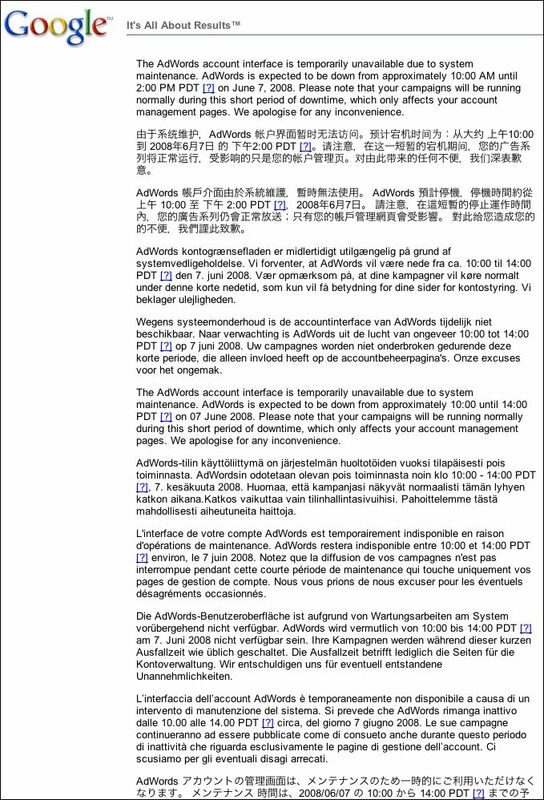 And even with 17 languages, the page comes up a bit short in serving all Adwords users — as Google Adwords supports more than 35 languages. What’s the lesson here? That when it comes to Web globalization, no detail is too small — including those details such as error strings, 404 pages, and “temporarily unavailable” pages.